Just about every site on the Internet these days requires a username and a password. We use passwords every day to login to Amazon, check our medical records, and to see what’s happening on Facebook. With the proliferation of logins we face every day it’s no wonder why many people choose to remember their passwords on a Post-It note stuck to the bottom of their keyboard or a notebook tossed into a drawer. 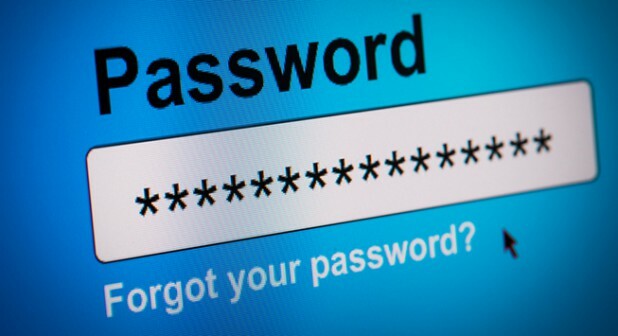 While certainly convenient, these methods of storing passwords have obvious flaws. Thankfully there is a plethora of software out there that can be used to securely store your passwords, help you generate new ones, and automate logging into a site. These password managers can store your passwords, help you generate new ones, and can even fill in passwords and forms for you. Every site tends to require or ban certain characters in a password. From a technical standpoint this is not necessary – passwords should be able to support any combination of characters, symbols, spaces, and numbers. However, due to lazy programming or arbitrary rules (or a combination of both) many sites force their users to use a mix of numbers and letters, both upper- and lower-case. Symbols are an example of where sites differ dramatically: Some sites will give you a short list of allowed symbols, while others will tell you that you can’t use any symbols at all. A few sites will allow you to use whatever characters you want for a password and still fewer sites require you to use symbols. So why is there a huge disparity among sites on what can be used and what cannot be used for a password? That’s an excellent question, and one no one seems to have a good answer to. Using a password manager though can help you generate passwords that will meet the site’s requirements, no matter how arcane they might be. Password lengths tend to be just as arbitrary as what is allowed in them. Some sites require a password that is at least 8 characters long. Some sites require more. Really bad sites don’t set a minimum length or specify lower and upper limits (must be between 8 and 12 for example). Again, chalk that up to lazy programming or bad corporate policies. It is generally accepted that, the longer a password, the harder it is to guess or crack. Allowing people to use special characters, including spaces, makes a password much more secure and memorable. For example, if a site allows spaces in its password one could use a favorite movie quote or passage from a book as his or her password, making the password both secure and memorable. Since sites have widely-varying password requirements it’s not possible to use this strategy on all sites, but for those that allow it, it makes a great way to keep a password in your head and off of the Post-It note. Many people re-use passwords. It’s just a fact of life that remembering one or two passwords makes life easier. Unfortunately this can lead to a huge security concern if a site’s database is compromised because now hackers can presumably use your common password from a breach at one site to login to another and wreak havoc. A password manager will allow you to create unique passwords that you don’t have to remember. Lastly, many of us never change our passwords. Once they’re set, that password becomes associated with that site forever and ever. Thankfully many sites (but again, not all) require people to change their passwords from time to time. The problem though is then we forget what our new password is and then we reset it back to something else, which is then forgotten again, and a vicious cycle is born. Again, a password manager eliminates this problem for you by safely storing your passwords for you. The password manager that I recommend is LastPass*. Their site, lastpass.com, has a lot of information on how to install and use their password manager. They have two flavors, the free version which should work for 99.9% of people, and a paid version that has higher security, secure online storage, premium technical support, and more. You can compare versions here. If you want to watch a video on how to setup LastPass, check it out over here. The way it works is simple: You create an account, download and install the browser add-on(s), and set a master password. Then, as you cruise the web, LastPass will offer to remember passwords for you. Better yet, it’ll sync those passwords to other computers (including your phone) for you if you are signed on. All you’ll ever need to remember is your master password. Everything else is done automatically for you. If you create a new account on a site LastPass will offer to generate a secure password for you and save it. Then, when you login in the future, your super-secure password is re-entered by LastPass. You don’t even have to know what the site’s password is so long as you are logged into LastPass. It’s amazingly simple yet powerful security. Please, check out LastPass or any other password manager you;d like. Using a good password manager such as LastPass will help you to stay safe and secure on the web! *I do not get any money from LastPass, they are not a sponsor of this site, and I am not paid in any way for this endorsement. They just make a quality product that I highly recommend using. Facebook is a great place to see the latest pictures of your grandkids, check up on that friend from high-school, participate in community and school groups, and stay connected with the latest news from your family. It’s also a great place for people with bad intentions to install malware on your computer, or, worse yet, impersonate you with a fake profile and scam your friends and family. While many quizzes are legitimate and fun, you should always be wary of any Facebook app that wants access to your profile. If an app wants access to your profile, be sure that you are aware of what it is asking for and understand that these apps, if given the proper permissions, can post to your wall without you knowing it, spam your friends’ walls and emails, and use your pictures in any way that they see fit. Luckily you can remove these apps by going into Settings, which is located in the menu that appears when you click on the downward-facing arrow next to the ? in the blue bar at the top of your screen. On the Settings screen you’ll see a left-hand menu option for Apps. Click on that. 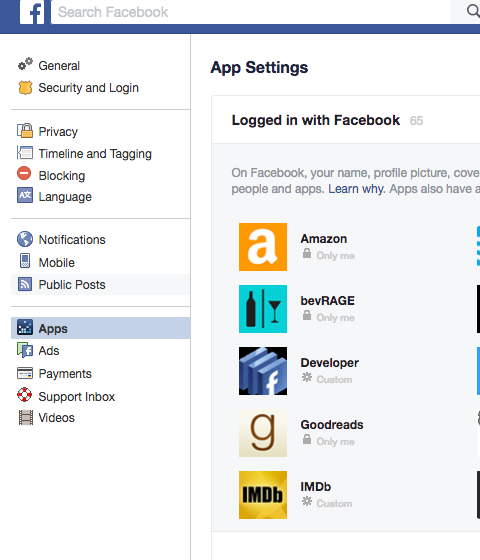 Then you will see all of the apps you have authorized in the main part of the page. To remove one, simply hover over it with the cursor and click on the X that appears to remove it. If you don’t want to remove the app you can click the little pencil icon next to the X and then edit the permissions that the app has to your profile. Dealing with Facebook impersonators is a rare issue but it has been a problem for many people. 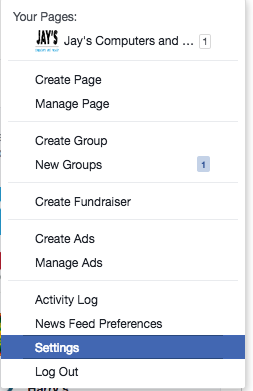 These bad people will grab a photo of you from your page, create a profile with it, add in basic information about you gathered from your real Facebook profile, and then send friends requests to your current friends. Once they have added a few, they’ll reach out as you and usually pester them for money, use their email addresses to send spam, and other nefarious acts. If you come across anyone pretending to be you the first thing you should do is report them to Facebook. Facebook will will eventually take action and shut down the imposter. You should also notify your fiends outside of Facebook if at all possible so they know that you aren’t asking them for money or trying to sell them Ray-Bans for $19.95. Be wary of the Facebook apps you let into your life. Some are fun and harmless but a few are out there to get you. Knowing the difference between the two will keep you and your friends happy on Facebook. Too often these five words bring panic, doom, and an utter sense of dread to the person who just lost all of their pictures, documents, music, and other files. Unfortunately there are many ways that files can be lost – some common ones are hard drive failure, accidentally saving over an existing file, power outage, corruption or encryption due to malware, a lost or stolen laptop…the list goes on. It used to be that ‘virus’ was the word de jour when it came to a computer that was infected – running slow, popping up ads, sending emails without your knowledge, or even deleting files. Nowadays the word ‘virus’ has been deprecated and replaced with the general term ‘Malware’. Malware consists of many different types of bad software that can be installed on your computer, usually without your knowledge or intervention. Types of malware include spyware, ransomware, adware, or scareware. Let’s break these down into their respective categories.